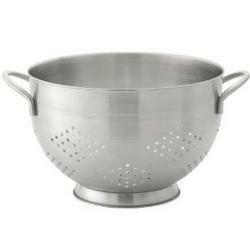 Pierced Colander with footed base and sturdy handles for washing, draining, steaming, and blanching foods. Made from 18/8 stainless steel; sturdy handles for secure maneuvering; 5-quart capacity. Pierced stainless bowl tackles heavier tasks; footed base elevates contents above draining liquids, like produce, pasta, grains, vegetables, and more. Use over a pot of boiling water as a vegetable steamer, dunk already cooked vegetables or pasta for a quick reheat, or blanch and drain fresh produce. 12 1/2" (HANDLE TO HANDLE) x 10" (DIAMETER) x 6 3/8"